For the card tonight, I used some paper I bought a few weeks ago. 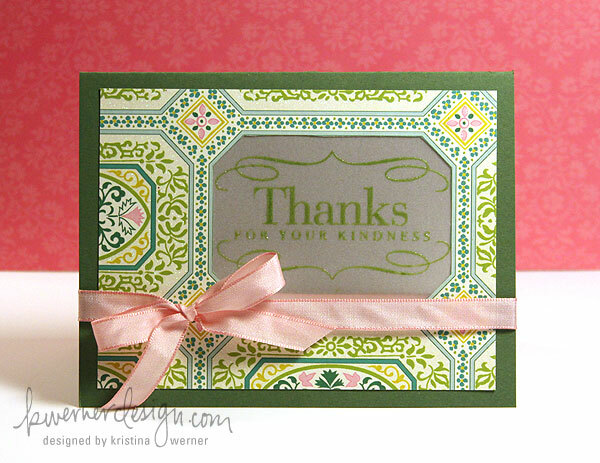 It’s the specialty paper pack from Anna Griffin’s Isabelle line. It’s not my usual style for patterned paper, but the patterns were so beautiful I couldn’t resist. That, and the colors are awesome! After seeing one of the patterns in particular I thought it would be fun to cut out a section of the pattern and use it as a window on a card.